Is it rose week? It just might be. I bought a big bag of edible rose buds at the Persian market. And I haven’t stopped eating them since. I decorated my White Chocolate Rose Cake with them, but I thought the pretty little petals deserved to be perched atop some swirled chocolate. Love bark at its fanciest. The base of this love bark is white chocolate. I tell you all the time, but my favorite is Lindt white chocolate. On top of the white chocolate, I swirled just a tiny bit of dark chocolate. The way I swirled it with my fork made it look like there is more dark chocolate than there really is. I also stirred a teeny tiny amount of rose water into the dark chocolate. Like, 1/4 teaspoon. You have to work quickly with room temperature rose water, and just as soon as you’re done quickly stirring it in, pour it on the white chocolate. Water and chocolate are not friends, but if you work quickly, you can make it work. Be sure to stir it into the dark chocolate, not the white–it seems to be more forgiving. Not that I stirred it into the white twice last week and wasted $15 worth of white chocolate or anything…nope, not me. If you’ve never eaten a flower before…these rose petals are going to have a very faint flavor and be ever-so-slightly crispy. Like the skin around a pistachio, you know? TheKitchn has a great guide to eating flowers, if you’re interested. So, if Romeo brings you a bouqet of roses, now you know what to do with them. Place the white chocolate in a microwave-safe bowl, and microwave on 50% power for 30 seconds. Stir, and repeat until the chocolate is almost all the way melted. Stir to melt thoroughly. It takes me 3 pulses, or 1:30 minutes. Spread the white chocolate onto the sheet pan in a 8 x 6" rectangle. Immediately (before the white chocolate can harden), melt the dark chocolate using the same method. On the dark chocolate is fully melted, very quickly, stir in the rose water. 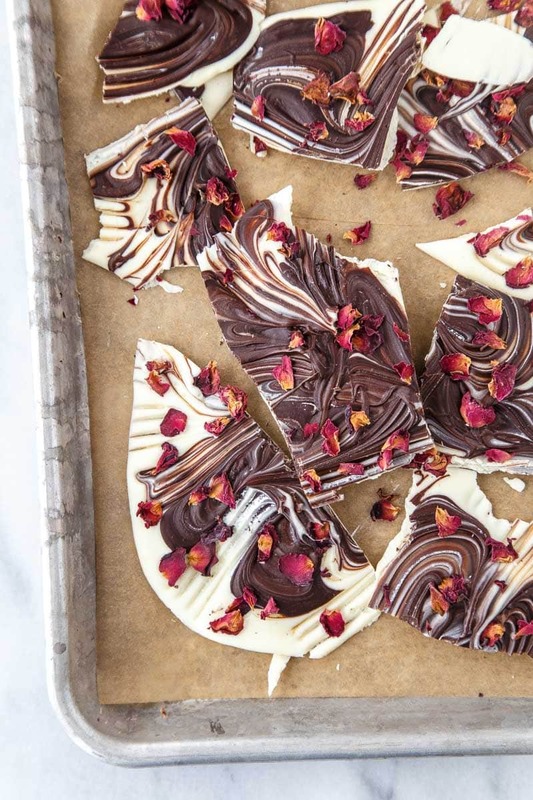 Be quick--if you let it set, the rose water will solidify the chocolate! Very quickly dot the dark chocolate on top of the white chocolate. 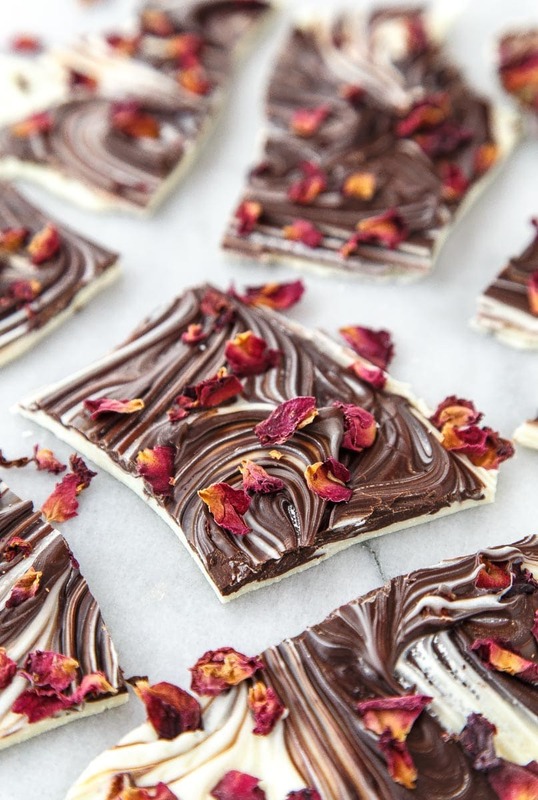 Sprinkle edible rose petals on top. Refrigerate for 20 minutes to set the chocolate. oh this looks so yummy!! I have never ate flowers before but I would try them though! Hi! A query. Will the bark be stable / not melt if it’s kept out of the refrigerator for say 30 mins. Thanks. By the way, enjoy the recipes you share. 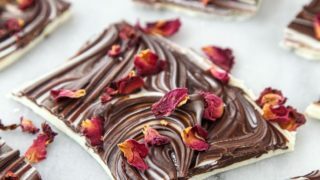 I did not know you could buy edible rose petals! Wow! This bark looks amazing! 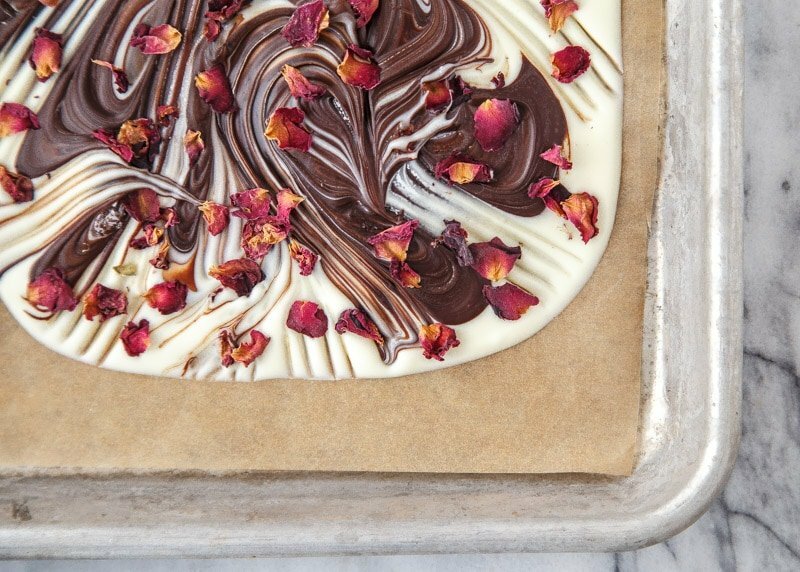 You are REALLY tempting me to get into this rose in food thing, so pretty! I’ve never had dried flowers alone, but I once had the most amazing candied rose and lavender petals — so delicious. Would love to try this too! This is so creative! And beautiful too! I am in love with this beautiful bark! I really like the touch of the rose petals! This is absolutely beautiful! If my hubby gave me this for Valentine’s Day I would be thrilled! These look so yummy (and pretty!). i LOVE Lindt chocolate :) my favorite! Such a great and creative idea. Those look delicious! Plus they are so pretty!! Hi, just wondering the shelf life of the bark with edible flowers – do the flowers tend to go too dry?